Heska Amuna Synagogue is affiliated with the Conservative Movement of Judaism. Conservative Judaism seeks to preserve Jewish tradition and ritual but is open to new inter­pretations of the law. For example, in contrast to Orthodox Judaism where only men are allowed to participate in most rituals, Heska Amuna is an egalitarian congregation, with both men and women participating in all aspects of our service and congregational life. The raised stage area at the front of the sanctuary is the bimah. Bimahs are usually situated so that congregants facing the bimah are also facing toward Jerusalem. The Rabbi, our ordained spiritual leader, often stands at the lectern on the right while the person(s) leading the service stands at the table on the left. This table is also used for reading the Torah. In the center of the bimah is the Ark (Aron Kodesh), which houses the Torah scrolls except when they are removed for read­ing. Above the Ark is the Ner Tamid, the Eternal Light, which recalls the fires that burned continuously in the Tem­ple in Jerusalem centuries ago. The Ner Tamid is never extin­guished, reminding us of the constant presence of God. Beside the Ark are two stands to hold the Torah after the reading but before being returned to the Ark. On the wall to the right of the Ark is a modern, artful representation of the seven-branched candelabrum(menorah) that was in the Temple of old. On the side and back walls of the sanctuary are large tablets con­taining the names of deceased members and relatives of our members. Lights next to names indicate the anniversaries of those deaths (Yid. yahrzeit) occurred during the current week. When lit, these names will be read during our weekly service and a special prayer will be recited in their memory. The memorial tablet on the back wall is from a congregation in Harlan, Kentucky that no longer exists. Even though we did not know the people whose names are listed there, we recite their names along with those of our congregation as a way to keep their memories alive. Judaism’s most sacred object is the Torah, a scroll of parchment on which the first five books of the Bible have been handwritten in Hebrew by skilled scribes. The Torah is the foundation of our reli­gion as it contains the earliest written Jewish history, laws, and traditions, superseding all other texts. Out of respect to what the Torah represents, we stand when the Ark is open and when the Torah is lifted and carried through the congregation with song and pageantry. The parchment of the Torah is attached to wooden rollers. The Torah has to be written with no mistakes; the letters must be clear and the writing not faded. If there is anything wrong with the scroll, it cannot be used until it is repaired by a scribe. The He­brew within the Torah is written without vowels, punctuation marks, and melody notations (Yid. trop) and requires special skill to read. During the Torah reading, two people knowledgeable in Hebrew (gabbai) carefully follow the reading in a chumash (see Our Books), which has the vowels, punctuation marks, and melody notations. Their purpose is to correct any mistakes the reader might make. Because one is not to touch the actual parchment, the reader uses a silver or wooden pointer (yad) to keep the place as he/she reads.When not being read, the Torah is covered by a cloth mantle. Un­der the mantle, a sash or buckle keeps the rollers clasped togeth­er tightly. A breastplate or silver shield hangs over the front of the Torah (reminiscent of the breastplate worn by the High Priest in the Temple of Biblical times). The pointer hangs over one of the wooden rollers. A silver crown often adorns the Torah to symbolize the “Torah is a crown for Israel.” The Five Books of Moses recorded in the Torah have been divid­ed into weekly portions (parasha) to make it conve­nient to read the entire Torah over a year’s time. A head covering (Heb. kippah, Yid. yarmulke) is worn by all men and many women during services. It is a traditional sign of re­spect, indicating an awareness of God. Jewish men and many Jewish women wear a prayer shawl (tallit). Though there are many different designs of the tallit, the common feature of all of them is the presence of fringes (tzitzit) on the corners. The command for wearing fringes is found in the Bible (Numbers 15:37-41). This wording makes up part of the Shema prayer (see Our Main Prayers) that will be recited during the morning service. At Heska Amuna, any adult who participates in services on the bimah is expected to wear a kippah and tallit. Two books are used during services. The book that contains the service liturgy is called a siddur in Hebrew. The siddur we use is the smaller red book named Eit Ratzon, which translates as “the right time for prayer.” Each double page con­sists of four columns. The leftmost column provides the pronuncia­tion of the Hebrew words in English. The second column is the Hebrew. The third column has the English translation of the He­brew, and the fourth includes explanations and commentary. The larger red book, called a chumash in Hebrew, contains the Hebrew, translation, and commentary of the Torah and other Biblical texts. Our chumash is Etz Hayim, which means “tree of life.” Since the Hebrew language is written right-to-left, our books may seem backwards to you; the page numbers in these books increase from back to front. Shema: The Shema consists of Biblical readings taken from the books of Numbers and Deuteronomy. It is considered by many to be the most important prayer in Judaism because it affirms the “uniqueness” of God, the most fundamental tenet of the religion. Many people recite this prayer when they awake in the morning and before going to sleep. Amidah: The Amidah is the core of every Jewish worship service; it is referred to as HaTefillah, or “The prayer.” Amidah, which literally means “standing,” is a series of blessings recited while standing. Using the image of master and servant, the Rabbis declared that a worshipper should come be­fore his or her master first with words of praise, then should ask one’s petitions, and finally should withdraw with words of thanks. Thus, every Amidah is divided into three central sections: praise, petitions, and thanks. During the morning service, there is both a private reading of the Amidah said in an undertone by individuals while standing with feet together and facing east and a public recitation led aloud by the service leader. Kaddish: At all Jewish services, various forms of a prayer called Kaddish are recited. Kaddish means “sanctification,” and cele­brates the attributes of God. The form most widely known is the Mourner’s Kaddish, which is recited to honor parents and loved ones who have passed away. Reciting the Mourner’s Kaddish is considered a true act of selflessness and kindness. Traditionally, individuals recite the Mourner’s Kaddish for 11 months after the passing of a close relative and again each year on the yahrzeit, the yearly anniversary of the passing. Other forms of Kaddish are Kad­dish D’Rabbanan (Rabbis’ Kaddish), recited after teachings from Rabbinic literature, Chatzi Kaddish (half Kaddish), recited between parts of our service, and Kaddish Shalem (full Kaddish), which concludes the Shacharit and Musaf services (see Our Shabbat Morning Service). Our weekly day of rest, Shabbat, is observed from sun­down on Friday through nightfall on Saturday. (All days in the Jew­ish calendar begin at sundown because each of the days of Cre­ation in the Bible concludes with “there was evening and there was morning.”) The services that are held on the Sabbath vary widely among congregations. 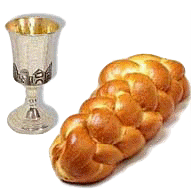 In our practice, there is always a Shabbat service on Saturday mornings. We often hold Kabbalat Shabbat (“welcoming the Sabbath”) services on Friday evenings. Other congregations include Saturday afternoon ser­vices and recite prayers at the end of the Sabbath (Havdalah). Many weekday work acitivities are prohibited on the Jewish Sabbath. Because of that, photos may not be taken, writing is not allowed, and cell phones many not be used anywhere in the building on the Sabbath. Our Saturday morning service lasts about two and a quarter hours. The formal service is conducted in Hebrew with explanations and a sermon given in English. Any Jewish person over the age of 13 may lead the prayers. Some prayers are read quietly while others are chant­ed and sung aloud in traditional melodies by the leader and by the congregation. Some prayers require a minyan, a quorum of at least ten Jewish adults over 13 years of age, in order to be recited during services. It is permissible to leave the sanctuary during services. However, exiting and entering the sanctuary when the congregation is stand­ing is discouraged to avoid disturbing people who are in prayer. The service on Saturday morning consists of four parts, which are described below. • Pesukei Dezimra This introductory service translates as “songs of praise.” It opens with a group of blessings called Birchot HaShachar or “morning blessings.” Each of these begins with the Hebrew phrase, “Baruch Attah Adonai” which translates as “Blessed are You, Adonai (God’s name)”. At the end of each blessing, the congregation responds with “Amen.” Following these blessings, the service consists of readings primarily from Psalms that are intended to establish the mood of the morning. This service consists of selections from pp. 10-41. • Shacharit This service is found in the siddur on pp. 42-74. It be­gins with the Barechu, the call to prayer, which can only be recited if a minyan is present. The Shema is found on pp. 51-53 (see Our Main Prayers). Many people cover their eyes as the first words of the Shema are recited so they can focus completely on the mean­ing of these words. As its final paragraph which mentions the fringes on the corners of garments is read, many people kiss the fringes of their tallit. The Amidah (see Our Main Prayers) is the largest part of this service (pp. 58-73). It is first read in an under­tone by individuals. The service leader then recites the Amidah aloud (pp. 58-64, 67-68, 70-72). • Torah Service The central part of the morning service is the Torah reading. The service surrounding the reading is found in the siddur on pp. 75-92. As prayers are recited, a Torah is removed from the Ark and carried through the sanctuary where many people show their reverence for the Torah by touching the Torah with their siddur or tallit and then kissing the siddur or tallit. The reading from the Torah is found in the larger red book Etz Hayim. The page numbers for the readings can be found in the service program and are also an­nounced. The reading is divided into seven portions. For each of these, a member of the congregation goes to the bimah to say blessings before and after the reading. Following the seven readings, the Torah is covered while a bless­ing for the sick (Mi Shebeirach) is recited. Visitors along with congregants are invited to stand during this time to say the names of those in need of healing. The final Torah reading follows, which usually repeats all or part of the previously read seventh reading. The blessings for this read­ing are chanted by the person who will recite the Haftarah, a read­ing taken from the prophetic books in the Bible. When the Torah reading is completed, it is raised and dressed and placed in a stand next to the Ark. The Haftarah, also found in Etz Hayim, is then chanted. The Torah service concludes on pp. 90-94 dur­ing which the Torah is again carried through the congregation and returned to the Ark. • Musaf This brief “additional” service in the siddur (pp. 93-106) completes the Shabbat service. Its main feature is an Amidah (see Our Main Prayers). Though similar to the Amidah in the Shacharit service, this Amidah is conducted differently in our congregation. The service leader recites pp. 93-96 aloud. Following this, individu­als read in an undertone pp. 93-94, 96 (bottom)-105, ex­clusive of the sections in gray print (which are specific for holidays) or small type. Following the Amidah are the closing prayers (pp. 107-112). Following the concluding prayers, we gather in the social hall to say the blessings over wine (kiddush) and bread (motzi). We greet each other with the words “Shabbat shalom” (Hebrew for “peaceful Sabbath”) or “Gut Shabbos” (Yiddish for “good Sabbath”). All are then welcome to share in a light lunch.